We’d love your help. Let us know what’s wrong with this preview of The Best Small Fictions 2016 by Stuart Dybek. This second installment of The Best Small Fictions continues to celebrate the diversity and quality captured in fiction forms fewer than 1,000 words. Forty-five acclaimed and emerging writers—including Alberto Chimal, Toh EnJoe, Kathy Fish, Amelia Gray, Etgar Keret, R. O. Kwon, and Eliel Lucero—offer readers “some of the brightest concise writing available today” (NewPages This second installment of The Best Small Fictions continues to celebrate the diversity and quality captured in fiction forms fewer than 1,000 words. Forty-five acclaimed and emerging writers—including Alberto Chimal, Toh EnJoe, Kathy Fish, Amelia Gray, Etgar Keret, R. O. Kwon, and Eliel Lucero—offer readers “some of the brightest concise writing available today” (NewPages). With spotlights on Texture Press and author Megan Giddings, the acclaimed new series, with its “finger on the pulse,” succeeds in its aim to make something big from many small things. To ask other readers questions about The Best Small Fictions 2016, please sign up. This second edition of The Best Small Fictions was exciting to read; I'm more and more a fan of this form. So much can be said so effectively, so well, in a relatively small amount of words. The emotional level can still be high, the suspense taut, the landscape potentially scenic or menacing or intricate depending on the author's intent. I had a several favorite stories in this edition and they are all so different: one told from the viewpoint of a plant, one a sad story about a mother's comb, This second edition of The Best Small Fictions was exciting to read; I'm more and more a fan of this form. So much can be said so effectively, so well, in a relatively small amount of words. The emotional level can still be high, the suspense taut, the landscape potentially scenic or menacing or intricate depending on the author's intent. I had a several favorite stories in this edition and they are all so different: one told from the viewpoint of a plant, one a sad story about a mother's comb, another of a girl's summer spent at a movie studio while her mother fades away at home. My impression is that readers of these fictions will gravitate toward their own favorites, inspired by their own life experiences as well as reading preferences. There is something here for everyone. I plan to read these stories again as I know I did not not reach several of them fully--but they left me wanting to know them better, a good feeling. I received an ARC of this book from the editor. This has not influenced my review. 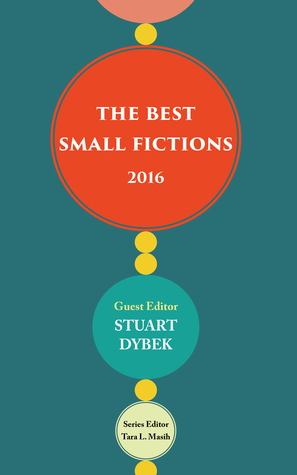 The Best Small Fictions 2016 edited by Stuart Dybek is the second annual collection of short fictions from around the world. Dybek is the author of five collections of short stories and two poetry collections. His awards include a Lannan Prize, a PEN/Malamud Award, a Whiting Award, a Guggenheim fellowship, and four O. Henry Awards. Dybek was awarded a MacArthur Fellowship in 2007. Tara Masih, the series editor, has won multiple book awards as editor of The Rose Metal Press Field Guide to Writing The Best Small Fictions 2016 edited by Stuart Dybek is the second annual collection of short fictions from around the world. Dybek is the author of five collections of short stories and two poetry collections. His awards include a Lannan Prize, a PEN/Malamud Award, a Whiting Award, a Guggenheim fellowship, and four O. Henry Awards. Dybek was awarded a MacArthur Fellowship in 2007. Tara Masih, the series editor, has won multiple book awards as editor of The Rose Metal Press Field Guide to Writing Flash Fiction, and The Chalk Circle: Intercultural Prizewinning Essays. She is the author of Where the Dog Star Never Glows: Stories and has published fiction, poetry, and essays in numerous anthologies and literary magazines. This is the second year I am reviewing The Best Small Fictions. Not being a short story fan I found small fictions a welcome change. The stories range from two or three pages down to Tweets. There is also a complete story in each of the small pieces. In order to complete this with a small word count is akin to poetry. Like poetry, words need to convey more than a simple message and must be chosen carefully. As an undergraduate, I had a history professor who would throw down a stack of blue books filled with essay answers and sarcastically say, "Why use one word when twenty will do?" We Americans tend to be wasteful with everything including words. Bigger is better and more impressive to most. Craftsmanship and intricate workings have been replaced with mass production. Short fictions aim to change this. Interestingly enough this can be seen in the first story, "Bless This Home” by Rosie Forrest. When asked how she could doubt something without even looking, the narrator responds, “My doubt is significant.” Four words take the place of a long explanation and deliver the same result but with a powerful elegance. In Paul Beckman’s “Healing Time,” the narrator refers to his sister as “Cleveland sister” which explains much about the relationship with his sister and the rest of the family without pages of details. The reader is challenged to think about the characters, setting, and story. Nothing is simply handed to the reader. It is an intellectual summons. The stories range from a few pages down to twenty-five words. Many of the stories have a serious tone, but surprisingly Michael Martone’s twenty-five-word story also has a twenty-five-word title -- playing jest with the shortness of the story. These stories have appeared in Fiction Southeast, Tahoma Literary Review, and many other publications. Also appearing are two stories from Rift, a joint effort between Kathy Fish and Robert Vaughan, which I reviewed last year. The stories this year cover a range of topics. Admittedly, some stories took reading through twice before I fully grasped the context. Stories like Amelia Gray’s “We Are the Fables” hit hard on the first read. Janey Skinner’s “Carnivores” views a family and a neighboring spider plant through the “eyes” of a Venus fly trap; it is an interesting perspective told in just three pages. “Illusions” by Curtis Smith brings together reality, fantasy and where they blur. The authors take the reader from nuclear fusion (Laird Hunt) to mental breakdown (Nancy Ludmerer) and everywhere in between. The Best Small Fictions 2016 lives up to offering the best in the field. All the stories in the collection offer the reader something unique. Although I am fairly new to short fictions,they have been growing on me over the last year or so. These stories show that there is much more to a short fiction than being a "small" story. It is a craft and an art that shows that greater things can be delivered with fewer words. Just about everything I wrote in my review of The Best Small Fictions 2015 holds true for the second installment of this annual series. Yet, the volume as a whole and the stories as individuals have a completely different feel to them than their predecessors do. That is no doubt influenced, at least in part, by the submissions themselves and by the final decisions made by a different guest editor. This is not to say one is better than the other: I feel the differences make each volume essential Just about everything I wrote in my review of The Best Small Fictions 2015 holds true for the second installment of this annual series. Yet, the volume as a whole and the stories as individuals have a completely different feel to them than their predecessors do. That is no doubt influenced, at least in part, by the submissions themselves and by the final decisions made by a different guest editor. This is not to say one is better than the other: I feel the differences make each volume essential reading for anyone interested in the form. In the previous volume, I was able to choose a favorite story; I can't do that with this installment. Is it a coincidence that these new favorites, the ones that hit me the hardest, are all written (I realize only now) by women? Series editor Tara L. Masih writes in her introduction that more women than men were nominated, so the odds were in their favor. The highest compliment I can pay to any work, and this holds true for each story in this book, is that it deserves a reread and that upon doing so, you will find that the rewards are even greater, more revelatory, than during the first, eye-opening reading. Some of these were great, some a little confusing, some I didn't really "get" at all. I admired most of them because short fiction seems harder to do well since economy of words is paramount. I couldn't read these quickly, since each story was packed with meaning in few words, and I could only read a 2 or 3 at a time. I will have to say that this is the first time I ever read a story narrated by a Venus Flytrap, and it was my favorite. Thanks to the publisher for sending me this copy to read and Some of these were great, some a little confusing, some I didn't really "get" at all. I admired most of them because short fiction seems harder to do well since economy of words is paramount. I couldn't read these quickly, since each story was packed with meaning in few words, and I could only read a 2 or 3 at a time. I will have to say that this is the first time I ever read a story narrated by a Venus Flytrap, and it was my favorite. (3.5) Best Small Fictions 2016 collects 45 super-short stories that stand out for their structure, voice, and character development—all in spite of often extreme brevity. Humor and pathos provide sharp pivot points. It helps to have an unusual perspective, like that of a Venus flytrap observing a household’s upheavals (Janey Skinner’s “Carnivores”), or of potential names gathering around a baptismal font (Alberto Chimal’s “The Waterfall”). Hard as it is to choose from such a diverse bunch, I do (3.5) Best Small Fictions 2016 collects 45 super-short stories that stand out for their structure, voice, and character development—all in spite of often extreme brevity. Humor and pathos provide sharp pivot points. It helps to have an unusual perspective, like that of a Venus flytrap observing a household’s upheavals (Janey Skinner’s “Carnivores”), or of potential names gathering around a baptismal font (Alberto Chimal’s “The Waterfall”). Hard as it is to choose from such a diverse bunch, I do have three favorites: Elizabeth Morton’s “Parting,” in which a divorce causes things to be literally divided; Mary-Jane Holmes’s “Trifle,” where alliteration and culinary vocabulary contrast an English summer with Middle Eastern traces; and Amir Adam’s “The Physics of Satellites,” which uses images from astronomy and a recent suicide to contrast falling, flying, and barely holding on. There are fewer highlights than in the previous volume, but this is still an excellent snapshot of contemporary flash fiction. I love flash fiction! I loved the premier release of The Best Small Fictions in 2015 and this is certainly a worthy follow-up. This time the guest editor is Stuart Dybek one of my all time favorite writers. There is definitely a bit of a different tone to this edition, a bit darker it seemed to me, many stories dealing with death and loss and disappointment. There are great stories here though, particularly a few in the surreal vein which I certainly have a fondness for. I recently re-read Katherine Mansfield's “The Wind” and many of the surreal flavored stories here remind me quite a bit of that story in tone and feel. Pitcher of Cream by Caitlin Scarano. Of all the stories in this anthology, this one grabbed me most. It appears to be literally floating in time and space as Sherrie Flick says flash fiction should. It's the story of a 'mother' in a house and a strange boy not made of skin that shows up at her fence all set in some kind of surreal phantasmagorical setting that is not detailed but hinted at. This is one that returns to me over and over something like a haunting with creepy music playing in the background, but somehow a sense of all is okay. Mama's Comb by Dianca London Potts. Another surreal tour-de-force in miniature form. A dying mother whose blood is turning sour. Written with a wonderful touch of dialect that is perfect for the story. The comb is one mama wanted on her grave that 'he ain't never gonna find' because the girl has hidden it in her pocket. Healing Time by Paul Beckman. Can a dysfunctional passive-aggressive family every actually heal? I definitely identified with much of what happens here. Worlds Worst Clown by James Kennedy. What do you do with a failed clown. These are the Fables by Amelia Gray. A story of how family fables are born and take root. Nice. The Toad by Grant Faulkner. A wonderful drabble of life, toads and oblivion. Excellent story much bigger than it's size which is exactly what flash and microfiction should do. Reunion by Megan Giddings. Inmate 144416 is released and returning home. A story of hope. Giddings is the featured author in this years anthology and it includes a wonderful short interview with her. First Night by Nancy Ludmerer. Another surreal story of a quite strange wedding night in a cabin in the mountains. This one kept me off my feet all the way through and left me that way. I keep thinking of it long afterward which is exactly what great fiction is supposed to do. Midsummer Gothic by Clio Velentza. A surreal story that left me with that amazing floating feeling. Two siblings in a bizarre landscape with a baby in the house and perhaps a dad somewhere or not. Something very strange has happened here but I am left to figure it out on my own. Overall a wonderful anthology of the year's best small fictions. The editors and readers are to be congratulated on another excellent compilation. Well worth the read for anyone interested in short form fiction – and who isn't in this day and age? But do please read these slowly, a few at most at a time, they are powerful and deserve your full attention. I'm very honored that one of my stories is featured in this anthology. The stories chosen are of very high caliber. As I said of the 2015 edition, this anthology would be an excellent textbook for any creative writing program, especially any course that focuses on the flash fiction form. There are numerous finalist stories listed in the back of the book that I plan to check out as well. Highly recommend this collection! This is a fantastic collection of small fictions, and introduced me to many new flash authors I haven't heard of. I was also impressed with the range of journals represented here--it shows that there are, in fact, a good number of presses running excellent flash fiction (if you had any doubts). The stories range from dark and creepy ("Milk Teeth" by A. Nicole Kelly; "Pitcher of Cream" by Caitlin Scarano) to the familial and domestic ("Healing Time" by Paul Beckman; "Reunion" by Megan Giddings; "T This is a fantastic collection of small fictions, and introduced me to many new flash authors I haven't heard of. I was also impressed with the range of journals represented here--it shows that there are, in fact, a good number of presses running excellent flash fiction (if you had any doubts). The stories range from dark and creepy ("Milk Teeth" by A. Nicole Kelly; "Pitcher of Cream" by Caitlin Scarano) to the familial and domestic ("Healing Time" by Paul Beckman; "Reunion" by Megan Giddings; "The Toad" by Grant Faulkner) to the politically charged and pointed ("The Herald" by Eliel Lucero). This collection is small--only 124 pages of fiction--but every story packs a punch. I didn't love every story, but even the ones that I wasn't enamored were objectively well-written and poignant stories. Good anthologies challenge you and your reading tastes, I think, and Best Small Fictions certainly does that. I will definitely be checking out the 2015 volume, and eagerly await 2017. I received a free copy of this book for review from the editor. I would actually rate this 3.5 stars if possible on Goodreads. I am a reader and writer of fiction but I am by no means an expert in either. I have only been studying the flash fiction form for a couple of years and am much more in tune with the "standard" short story form (5 to 20 pages). I love flash fiction, but sometimes it goes right over my head. While Stuart Dybek is a very well-respected author, I am unfamiliar with much of I received a free copy of this book for review from the editor. I would actually rate this 3.5 stars if possible on Goodreads. I am a reader and writer of fiction but I am by no means an expert in either. I have only been studying the flash fiction form for a couple of years and am much more in tune with the "standard" short story form (5 to 20 pages). I love flash fiction, but sometimes it goes right over my head. While Stuart Dybek is a very well-respected author, I am unfamiliar with much of his writing. Out of the 45 or so stories in the collection there were about 17 which I really enjoyed. The rest either were more like poetry (which I don't know a thing about honestly), too avant-garde for my taste, or I just didn't get them. For example the story "Hey" by R.O. Kwon, which ended too awkwardly in an attempt to be flashy. And "A New Cycle" by Nathan Leslie made absolutely no sense to me whatsoever. I hate saying that because I absolutely loved Tara Masih's "Rose Metal Press Field Guide for Flash Fiction" so much. That said, here is what I loved about this book. "Healing Time" by Paul Beckman made me laugh out loud, despite the sad overtones about dysfunctional families. "The California Water War" by John Brantingham displayed a kind of grown up sibling rivalry for one girl in just two pages. Deep and memorable. "Carnivores" is narrated by a Venus Fly Trap type of plant. Many of the stories have a darkness or sadness to them which drew me into the reality of life in an artful way, like "Papa, Too" by Britt Haraway, which details a happy scene between an alcoholic dad and his little girl during one of their visits. Michael Martone's story has a title slightly longer than the story itself. "Reunion" by Megan Giddings is another good one, from the perspecitve of a woman who is receiving her man back from prison, otherwise known as "Inmate 144416." "The Best Small Fictions series is officially two for two – it can boast the most important book published last year with BSF 2015 and the most important book published this year with BSF 2016. And as it continues to establish itself alongside such renowned series as Best American Short Stories and The O. Henry Prize Stories, this significance will not wane." There's a great range of flash fiction in this collection and there's a lot to like. "Carnivores" by Janey Skinner is my favorite out of the entire anthology because of how original the POV is, how it makes new an overused trope in literary fiction (which I won't tell you what it is because it spoils the story). I'm glad these anthologies exist because flash fiction deserves to be held in the same regard as great poetry, great short stories, great novels. With each story read I thought, "this is the best" and thedy all turned out to be the best. Of course I have some favorites and there were no stories I didn't like. An exceptional collection and (full dissclosure) My story "Healing Time" is in this book. This book is like a mouth full of pop rocks. The stories get inside you and explode. The best is truly represented here. The arrangement was perfect. How else should you end a flash fiction anthology but with Etgar Keret's "The Story Victorious"? Here we have a splendid variety of short-shorts, realistic, fantastic, prose poem-ish, stories. This collection includes a healthy weight of surrealism. Some of my favorites include: "Carnivores" by Janey Skinner explores mothers eating their young, "A New Cycle" by Nathan Leslie where boys mysteriously live in a chamber filled with dogs, and "First Night" where a couple rents a home filled with snow. And then some beautifully humorous pieces: "The Physics of Satellites" by Amir Adam where a docto Here we have a splendid variety of short-shorts, realistic, fantastic, prose poem-ish, stories. And then some beautifully humorous pieces: "The Physics of Satellites" by Amir Adam where a doctor makes a most unusual house call. In "Goodbye Piano" the narrator describes the demise of their favored musical instrument. "We smashed the piano with a sledgehammer out on the front yard. It wasn't that we hated it or wanted to teach it a lesson." You've got deliciously creepy, "Reunion" by Megan Giddings - "Jana's best friend advises her to treat Inmate 144416 like a feral cat." Don't forget, gorgeous lines: "The lawn mower has become so many things." by Daniel Aristi in "Tempus Fugit". much wood again." by Rosie Forrest in "Bless This Home. And: "There is meant to be more of a ceremony, but the presiding scientists have gorged on the impatience, not merely implicit, of the gathered dignitaries and their non-political underwriters, not to mention on their own madness-tinged excitement, so the "switch" gets thrown well before the champagne arrives." - found in "Star Date (Avant-HIstory" by Laird Hunt. Read full review at NewPages. I received an Advance Review Copy of The Best Small Fictions 2016. Review to be published at the Bath Flash Fiction Award. Rating to follow. My reading of this book, as well as other flash fiction collections, is partly influenced by my desire to become proficient at this form. Ironically, I read this collection before putting my hands on the first volume, published in 2015. As a reader, each story is a pleasure in itself. I loved picking up this book each time I had a chance to read because I experienced that thrill of wondering what I would read next with each story. The genre itself is fascinating because it encompasses a wide rang My reading of this book, as well as other flash fiction collections, is partly influenced by my desire to become proficient at this form. Ironically, I read this collection before putting my hands on the first volume, published in 2015. As a reader, each story is a pleasure in itself. I loved picking up this book each time I had a chance to read because I experienced that thrill of wondering what I would read next with each story. The genre itself is fascinating because it encompasses a wide range of forms, bending genres in experimental mashups which, when done well, can encompass an entire narrative arc, character change or descriptive oeuvre in the fraction of the space of a short story or novel. One thing this collection does very well is to provide a representation of the range of writing that can be entertained in this short form. I’m so happy this book of small stories is back for 2016! Every word is precise and it’s easy to see the pictures, to step inside. In that way, the smallest stories can have a giant impact and many of these deliver. "Strawberry Festival," by Sophie Rosenblum, is a sensory delight, shoving our expectations against what we get. And as good small fiction does, it starts tiny and opens up to the great wide world. "Parting," by Elizabeth Morton, goes to the extreme to illustrate the everyday, leaving behind the residue. “Easter, 1991,” by Vincent Scarpa, where preparing for an egg hunt after a family crisis is really about preparing to go on, and that juxtoposition leads us to more than we anticipate. “Conductivity,” by Dawn Raffel, is a masterful conservation of words evoking images with so much left lingering in the empty spaces. “Good-Bye, Piano,” by Megan Giddings, tells itself in reverse, letting go little notes of story like crumbs to follow, making clearer as we go the difference between expectation and what we get. I was provided an ARC in return for an honest review. Another year, and another edition of The Best Small Fictions! I've always enjoyed short fiction and, thanks to last year's compilation, I began to develop a new appreciation for microfiction--perhaps some of these stories could even be classified as nanofiction. As with the previous volume, the stories were nominated by literary magazines, and the final selection was made by the guest editor, Stuart Dybek. In the Foreword, series editor Tara L. Masih notes a dramatic shift in the topics and forma Another year, and another edition of The Best Small Fictions! As with the previous volume, the stories were nominated by literary magazines, and the final selection was made by the guest editor, Stuart Dybek. In the Foreword, series editor Tara L. Masih notes a dramatic shift in the topics and formats from last year to the present, perhaps attributable to opening the process up to international submissions. At any rate, I found the overall quality of the stories to be excellent--this year seemed edgier, somewhat darker, and perhaps more enjoyable as a result. As I did last year, I tried to pick a few favorites and failed: it's extremely difficult to do so when the standards are so high. However, I did notice a preference for the longer works and more traditional forms, but that probably says more about my tastes than the content of the book. The topics are diverse, and range from a one-night stand with a clown to a grease fire at a Dunkin' Donuts to a well-executed narrative from the point of view of a carnivorous plant. There are stories with subtle touches of humor, others that speak to the raw desperation of people pushed beyond the limits of human tolerance, and a few that manage to paint richly detailed pictures with the barest minimum of words. All in all, I would recommend this volume highly for anyone who appreciates the short form. Great to see so many familiar names in here & some fabulous examples of what constitutes good flash fiction. I enjoyed the brevity of the stories contained in this book. There were many very good short fictions like "The Solidarity of Fat Girls" by Courtney Sender and "Carnivores" by Janey Skinner. Some of the stories, however, left too much out to get a good sense of the character(s) and/or point of view. And, this is the challenge of short fiction -- to develop the elements of fiction in under 1,000 words (character, plot, theme, point of view, etc.). As a writer, I am exploring the short fiction genr I enjoyed the brevity of the stories contained in this book. There were many very good short fictions like "The Solidarity of Fat Girls" by Courtney Sender and "Carnivores" by Janey Skinner. Some of the stories, however, left too much out to get a good sense of the character(s) and/or point of view. And, this is the challenge of short fiction -- to develop the elements of fiction in under 1,000 words (character, plot, theme, point of view, etc.). A lovely little introduction to a community I've always seen at the periphery. This was a great resource to see who's IN and who's doing great work. But, y'know, not always amazing pieces despite being the Best Small Fictions. Best: "The Thing Built to Fly is Not a Promise," "These are the Fables," "In the Ditch, Minnesota I-35," "World's Worst Clown," and "Black." Wow! Thanks for existing, flash writers. And mags for taking their work and keeping yourselves going. Like Dybek’s own work, these small fictions are breathtaking when small moments have larger meanings, or larger questions loom beyond the mere words presented on page. Like, a sad and humorous take on “hours in such conversations” in Grant Faulkner’s “The Toad.” The truth behind a plant’s misguided observations on molting in Janey Skinner’s “Carnivores.” A father’s bizarre reason for plugging in dehumidifiers in Jessica Plante’s “Natural Disaster.” The morbid “blue and silent wind chime” of Vincent Scarpa’s “Easter, 1991.” A profound word play in Mary-Jane Holme’s titled “Trifle” between the worldly and the domestic. Indeed, there is a gem for every reader in The Best Small Fictions 2016. The problem with any "best of" anthology is always the question of "but what about..." that lingers. Dybek has done a good job collecting these short short fictions (though I might argue some of them are more prose poem that short short story), but many of them blur together, and few of the pieces truly linger. Still, this book is a great primer to the short short story, a genre fast becoming the new trend in short fiction. Stuart Dybek has published three short story collections: Childhood and Other Neighborhoods, The Coast of Chicago, and I Sailed With Magellan; and two volumes of poetry: Brass Knuckles and Streets in Their Own Ink. He has been anthologized frequently and regularly appears in magazines such as the New Yorker, the Atlantic, Harper’s Magazine and the Paris Review. He has received numerous awards, incl Stuart Dybek has published three short story collections: Childhood and Other Neighborhoods, The Coast of Chicago, and I Sailed With Magellan; and two volumes of poetry: Brass Knuckles and Streets in Their Own Ink. He has been anthologized frequently and regularly appears in magazines such as the New Yorker, the Atlantic, Harper’s Magazine and the Paris Review. He has received numerous awards, including: a 1998 Lannan Award; the 1995 PEN/Bernard Malamud Prize "for distinctive achievement in the short story"; an Academy Institute Award in Fiction from the American Academy of Arts and Letters in 1994; a Guggenheim Fellowship; two fellowships from the NEA; a residency at the Rockefeller Foundation's Bellagio Center; and a Whiting Writers Award. He has also received four O. Henry Prizes, including an O. Henry first prize for his story, "Hot Ice." Dybek's story, "Blight," was awarded the Nelson Algren Prize and his collection, Childhood and Other Neighborhoods, which was nominated for the National Book Critics' Circle Award, received the 1981 Prize for Fiction from the Society of Midland Authors and the Cliff Dwellers Award from the Friends of Literature.